See below, a page from a high school textbook in use in New England in 1849, Elijah Burritt’s The Geography of the Heavens. Ever hear of this planet? 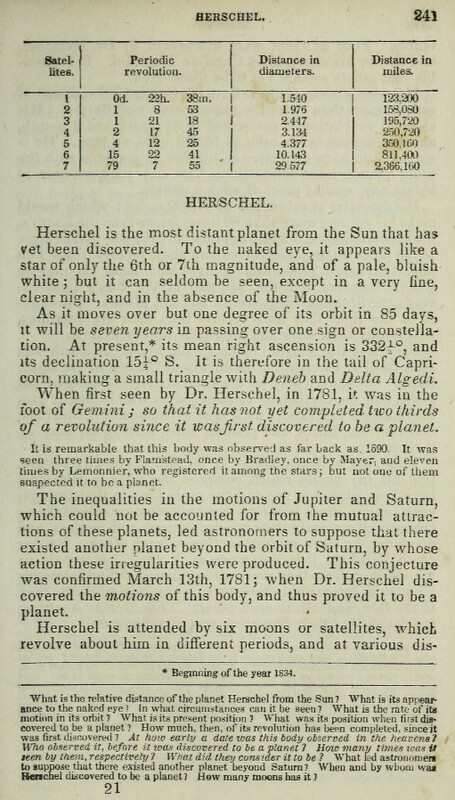 The name for the seventh planet was up in the air (no pun intended) for years after its discovery in 1781. The British were calling it “Georgium Sidus” (George’s Star), after King George III. (Flattery will get you everywhere. When Gallileo discovered the moons of Jupiter in 1610, he called them “Cosmica Sidera” (Cosimo’s Stars) after his patron, the Grand Duke de’Medici. The Americans, of course, were not huge fans of King George III. So they named the planet after its discoverer, William Herschel. Still others called for it to be called “Neptune.” But, in the end (again, no pun intended) the scientific community adopted the name “Uranus,” much to the distress of every 7th grade science teacher.